Stylish and Creative, Mark "Peace" Thomas is former President of the Los Angeles Chapter of the American Disc Jockey Association, a national non-profit disc jockey association dedicated to raising standards in the disc jockey industry. Mark went on to serve as President of the national ADJA in 2001/2002 and he finished his last year in 2003 as an advisor while handling the treasurer position. His article "How to Choose a Disc Jockey" has appeared in The Knot's The Wedding Pages along with numerous wedding-related websites. Mark has also been interviewed and quoted in national editions of Modern Bride & The Knot's Wedding Pages on behalf of the ADJA. 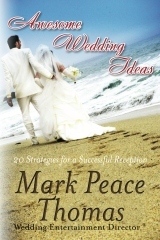 He has also written numerous wedding-related articles for WED Magazine, which was distributed throughout Los Angeles & Orange County. Mark is very active in educating disc jockeys on how to improve their standards, performance techniques and professionalism. He has written articles for the DJ industry magazine, Mobile Beat and has been interviewed for DJ Times Magazine. Mark teamed up with his colleague DJ Zan to present The Art of Interaction at the 2006 Mobile Beat DJ Conference in Las Vegas to teach disc jockeys from around the world how to improve their skills. They returned to Las Vegas in 2014 to present "The Art of Interaction 2.0". This time with a new follow-along dance written by Mark Peace Thomas called: Face The DJ. If you are looking for an entertainer that can handle nearly any type of event, whether it be a low-key, sophisticated society event or a high-energy interactive extravaganza, look no further. With over 20 years in the entertainment business, "PEACE!!" 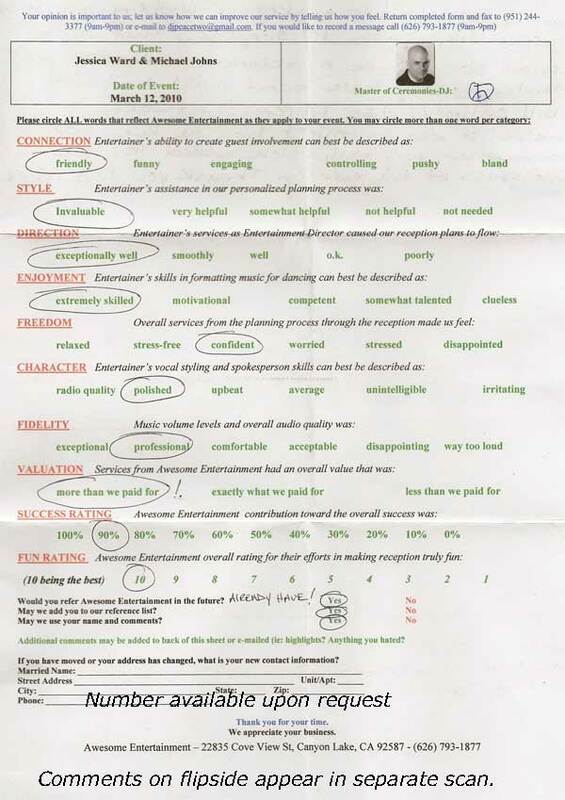 has a reputation for exceeding his client's expectations. The Song Remains the Same after 29 years! "DJ Peace was absolutely amazing. He made our wedding the most wonderful and special event. He was enthusiastic, classy, and made our guests feel welcome. We greatly appreciated his attention to detail and family vibe. Every guest mentioned how professional he was and that our wedding was the best wedding they'd ever been to . . . we believe DJ Peace played a significant role in making our wedding beyond memorable. " 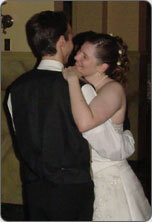 "I haven't had a chance to personally thank you for a SUPERB job that you pulled at our wedding. I can't thank you enough. You guys really ROCK. Up to this day, we are still receiving compliment after compliment about how different and organized and fun our wedding was! Even my dad, who barely speaks English compliments how good you are!!! - Venny& Rudy, December 26, 2008. You were Great!" "All our guests said we had the "best wedding". They all loved the music & said our DJ was very entertaining and spontaneous. We made the right choice of hiring you. Thank you so much!" - Hazel & Ben Ma.Guerrero, 09/27/2003, Pacific Palms Resort. Mark Thomas was born in Manchester, New Hampshire, where he developed a love for music by discovering his family's various music collections. Mark spent hours listening and learning about music ranging from Perry Como to The Beatles. He eventually started his own music library, which reached over one thousand albums by his early teens. Mark formed Double DJ Music Service at age sixteen with his twin brother Jon. Their first professional job was for their Central High School "Toga Dance". Mark attended all his classes in full toga, with a 45 vinyl record hanging from his belt , to promote their first professional appearance (pictured at right). The dance was such a huge success that Double DJ was asked to handle all of the upcoming school events. Positive word-of-mouth began to spread and soon Double DJ was providing music for house parties, birthdays and weddings. Mark moved to Pasadena, California, in 1984 to study acting, dance and voice at The American Academy of Dramatic Arts. Mark remained an avid record collector and began to get involved in local bands as a singer and songwriter. Four years later, Mark set sail on Holland America Cruise Lines as Disc Jockey and cruise staff member. His responsibilities included entertaining passengers seven nights a week in the nightclub and hosting various events (pictured at left: comedian Rick Starr showing his love for DJ Mark Thomas during the "Wipe Out" drum contest aboard Holland America's Nieuw Amsterdam). Since 1988, Mark has also worked for Royal Cruise Lines, Princess Cruise Lines, and Norwegian Cruise Lines in the Caribbean, Mexico, Hawaii and South America. In addition, Mark has entertained at many fine Los Angeles area establishments. Mark returned to dry land and landed in Studio City, California, where he started Awesome Entertainment DJ Service while working for Black Angus Funbars. 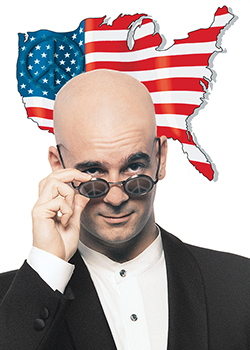 Years later, Mark surprised two hundred of his peers at the 1997 American Disc Jockey Awards by shaving his head onstage and becoming "PEACE!!" (The disc jockey formerly known as Mark Thomas). The "peace symbol" originally appeared in Awesome Entertainment promotional materials to parody The Artist Formerly Known as Prince. 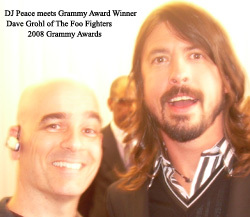 Peace took a quick photo with Dave Grohl of the Foo Fighters before Dave & his bandmates accepted the 2008 Grammy Award for Best Rock Album. Grammy winner Al Jarreau and his son take time out for a picture with DJ PEACE, Zan and Keith at the 49th Grammy Awards Pre-Telecast. Al Jarreau is the only vocalist to win a Grammy for three categories including pop, R&B and Jazz. 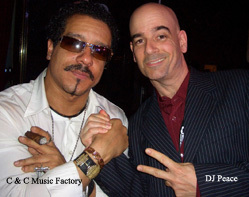 DJ Peace says hello to Quentin Tarantino on the red carpet before the 2007 Grammy Award telecast. Not only is Tarantino a groundbreaking filmmaker, he has some of the coolest soundtracks in film! Zan and DJ Peace catch up with Grammy winner Tony Bennett at the L.A. Convention Center. © 2003 - 2018 Awesome Entertainment, Inc. All rights reserved.